Foto Friday CXIX – ..:: NJ Brideau ::.. 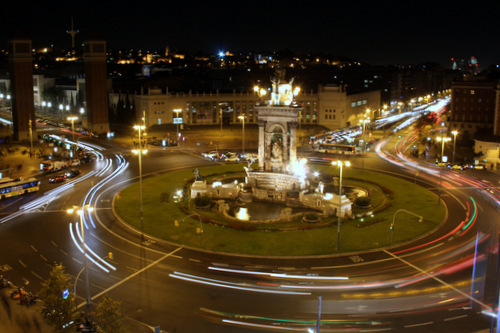 This is a view of Plaça d’Espanya from the top of the Arenas shopping center in Barcelona. The shopping center is a big modern circular building where there used to be bullfights. If you follow the road on the upper left of the picture it will take you to Museu Nacional d’Art de Catalunya, another magnificent building in the city. We went to the top of the shopping center in order to catch a view, and try and grab a snack at the rooftop restaurants. This picture turned out almost like I wanted, the timing of the lights made it very difficult to get cars moving on all sides of the circle, and then my arms made it difficult to keep the camera still for three seconds. 3.2s f/7.1 18mm ISO 100. Cropped. Au revoir until next week. Good idea for a picture this one!